We cook for the love of cooking. It’s a hobby, a passion, a calling… whatever you want to call it, it’s a person thing and it’s an art. It’s an escape. We like to feed other people (and ourselves), like to make other people happy, but most of all, we love to cook for ourselves. The craft of cooking is different, and to be discussed another time. The art of cooking is the bedrock of what we do. Art is expression. Art is passion. Art is our release, our grip away from reality, our creative outlet. Imagine what you can do with a few simple ingredients. Imagine the result, the beauty in your food. Be creative. Express yourself. Your food is art, and it’s part of you, and no one can make it exactly the same as you. You will not make the food in this blog as I do, as I cannot make your food just how you do. You embody yourself in your art, and no one can replicate it. All of that being said, I think we can agree on a few things. One, culinary arts is in fact an art. Two, sometimes you don’t have time to make masterpieces of food. Like on a Monday night when you’re tired and take our sounds great. BUT, sometimes you do. Sometimes it’s the right thing to do. Sometimes you need to escape into the ingredients, seeing the project to its delicious fruition. Sometimes a complicated project is just what you need to put your mind at ease and find the zen you’ve been looking for. I’d like to think the following recipe is one of those recipes. The ingredients are simple. The techniques are not difficult. But there are a lot of steps, each one requiring a high attention to detail and high level of culinary awareness. It’s not a beginner’s recipe, and the end result will be proof enough. It’s also nothing new. This isn’t re-inventing the wheel. This recipe is a time honored classic pairing that you would find on good menus in the spring, or high end restaurants during Sunday brunches. 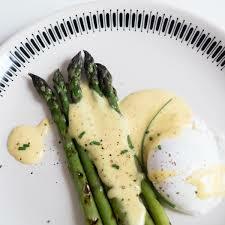 Asparagus, lemon, eggs, hollandaise… classic, and classic for a reason. It’s delicious, and IF you can make this, IF you have the patience, IF you feel the passion and want to be part of it, you and your guests will be rewarded. It’s a great dish, a spring dish good any time of year, and I hope that one of these days you will be inspired to try it. Fill a medium sized heavy bottomed stock pot 3/4 with water. Salt heavily. Have an ice bath ready. Bring to a rapid boil, submerge the asparagus and cook until barely al dente. This will take 45 sec to 1 minutes. Remove the asparagus from the boiling water and plunge directly into the ice water. Let cool completely. Remove the asparagus from the water, pat dry and reserve. In a small non-reactive heavy bottom sauce pan, begin reducing the wine with the lemon juice, shallot and tarragon. Reduce by 3/4. Remove from the heat and strain. Place a metal mixing down over a shallow pot of simmering water. In the mixing bowl, add the egg yolks and wine reduction. Using a balloon wire whisk, begin whipping. It will initially appear frothy and disorganized. Be persistent. As it begins to thicken and heat up, whisk for 30 seconds over the simmering water, 30 seconds away from the simmering water. This will prevent you from cooking the eggs. You will know it’s ready when it gets to the ‘ribbon’ stage, or when you run the whisk through the ‘sabayon’, it leaves thickened ribbons behind. Turn off the water. Gently and slowly pour the butter into the sabayon, while continuously whisking. it should be thick and slightly airy. Season with salt, pepper and the cayenne. Add the chopped tarragon. Reserve in a moderately warm place, covered. Fill a small heavy bottomed sauce pan half way with water. Add 2 tbsp white vinegar and a liberal amount of salt. Bring to a simmer. Stir the water to create a small vortex. Crack the eggs and drop them into the moving water, one at a time. Let the water come back to a simmer and cook for approx 30 seconds, and then turn the water off completely. Let sit for a couple minutes. You want the whites to be barely set, and the yolks to be runny. You can hold the eggs in the warm water until ready to serve. Heat a grill to high heat. Coat the asparagus with a small amount of oil (too much will cause a flare-up which lends a jet-fuel flavor and ugly black finish to the asparagus), the lemon zest, salt and pepper. Grill until slightly charred. Divide the asparagus among three warm plates. Remove the eggs from the warm water with a slotted spoon, blot dry with a paper towel, and place one egg on top of each bundle of asparagus. Spoon the sauce over the top and elegantly around the plate. Please note, a lot of chefs like to add Parma ham, Speck ham or prosciutto to the asparagus. While delicious (and it is!) I don’t because the dominant and salty flavor of the ham will drastically change the dish, and I want the delicate flavors underneath to come through. But, by all means, if you like the way it sounds, go for it, it will still make for a great dish!